Client QuickBooks, Peachtree, Mas200, etc files are migrated to the hosted Cloud environment. Your ezcfo team will be given the same mirrored view of your QuickBooks file(s), invoices, etc, in order for you (“the client”) and us to work on the same files. There are no accountant’s copies of QuickBooks. No worries about what is the “most recent” version. No back and forth determining what QuickBooks version (year) should be used. A dedicated folder tree customized to your company will be set-up in the Cloud environment. Invoices are scanned and uploaded to the cloud. No misplaced or lost invoices. Filed away according to vendor, customer, bank account, etc for ease of use. “To be processed” folder is created to facilitate your daily, weekly, and monthly work. Determine the internal and external controls around your process. Work in the current environment enough to understand how everything works. How information flow will work. Scanner Set-up vs. Email Account. Determine the authorization method by the client for any bill payments. Determine the best way to communicate (email is usually or preferred option) between us (your accountant) and you (client). Operate within this environment for approximately 3-4 weeks in order to refine the process. 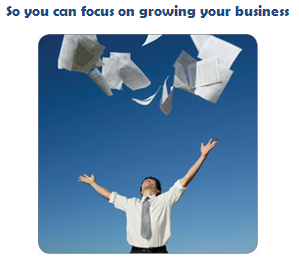 Write up detailed procedures for each new business process and migrate the process to our outsourcing partner. Detailed procedures will allow for standardized work to be performed and the people to become interchangeable. This will not cause reliance on one or two individuals. The reliance will be on the SYSTEM, NOT the PEOPLE. Develop work flow management within our workflow tool in order to organize and process daily, weekly, and monthly bookkeeping, accounting and CFO functions. Balance efficiency vs. effectiveness of any processes/controls put in place. Schedule monthly meeting with business owner/ vested parties in order to understand the company’s financial position, cash flow forecast and needs, as well as profitability.